When we speak of identity (personal or collective), we face a long list of arguments and statements by various philosophers, anthropologists, psychologists, and sociologists. We defend the one with whom our loyalties lie and challenge the loyalties of others. In a contemporary society that places high value on transparency and operates with less obvious barriers of space and time, questions concerning ego, belonging, and governance inevitably arise. We can probably all agree on the difficulty of identifying immovable characteristics of a social context—determined by rules rather than conditions—in which a dialogue between differences is only possible on the premise of division and separation. Therefore, defining the meaning of “identity” is perhaps one of the most interesting disputes today, especially when we move away from the individual and approach larger contexts that touch upon sociology, politics, and the human sciences. Assuming that we all inhabit the same world, we might consider that we are all equal and maintain comparable identities, though reality contradicts this uniformity of development. Circumstances, situations, and conditions change. In the quest to “affirm ourselves to be different from the others,” we could take Nietzsche’s maxim “Become the one you are.” To approach our identity in that way, we “create in order to be”—a type of creative affirmation. Alternatively, we could defend the self by not mixing with others, thus affirming our identity and characteristics through a negative approach—a negative affirmation. We have two poles: the positive and the negative, the one that builds and the one that defends, the full and the empty….And so it is with the artist Mikayel Ohanjanyan, who gives us a singular point of view about existence and identity through his art. 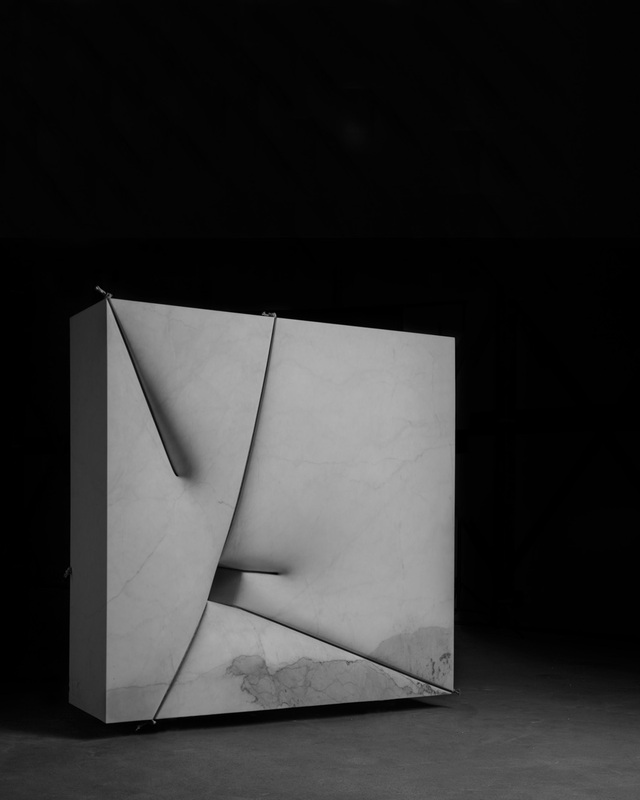 For Mikayel Ohanjanyan, the cube represents a metaphor for the human being in different contexts: the physical, the psychological, and the symbolic. It’s a kind of self-portrait. Its simplicity and perfection are already a symbol, which does not conclude in itself, but opens up opportunities to multiply infinitely. His “cubes” of white marble, elegantly ripped up and perforated as if they were made of paper, represent existential questions on existence and the material itself. The cuts and perforations become passages and doors to look through, to strive towards other landscapes. Ohanjanyan is deeply influenced by Armenia, his birthplace whose rocky terrain, impressive landscapes, and history of conflicts opens the imagination to sensations other than simple enjoyment. Ohanjanyan’s artworks research and combine two issues: The question of belonging to a cultural code and the challenge of the material itself as representative of the former. The apparent simplicity of his works is an entryway into a dialogue about statics and dynamics, the outside and the inside, strength and weakness, tension and stillness. The sculptures reveal a deep awareness of the steadiness of their identity; metaphorically they express the doubt and the drama of (his) life and the society that he lived in up to the present moment. In his most recent works, the vacuum occupies a space that indicates not absence, but rather “another form represented by another material of different texture and rhythm.” In fact, these spaces/non-spaces are born from the conversion of objects and shapes to their negative counterpart, taking on the meaning of negation and opposition, though free from any hostile connotation. These works intelligently describe the identity of the form and the artist’s thought process. The emptiness is no longer absence and vacuum of meaning, but it represents a tangible existence in the totality of its apparent absence. Sarah Corona: Mikayel, where does your art comes from? Of course not geographically, but in terms of the idea, concept, and spirit—spirit because your works carry a strong aura, although they are very abstract and minimal in their aesthetics. Mikayel Ohanjanyan: My works are born simply from observation and reflection of what surrounds me, basically the human being in all its complexity and his relationships with himself, with others, with nature, and so on. At the same time, I conduct a parallel research of equal importance, that of form. The clear idea for a new work comes up when these two studies meet, without one prevailing over the other. This magical moment can happen after a long meditation (temporal or conceptual) or just in a moment. Sometimes it happens that the shape discovers the concept. Other times it’s the contrary—the concept finds its shape. I also think that everything new has origins in faraway places, or at least it is based on past experiences. SC: You define the “cube” as a metaphor to represent the human being. Is that going a bit far? 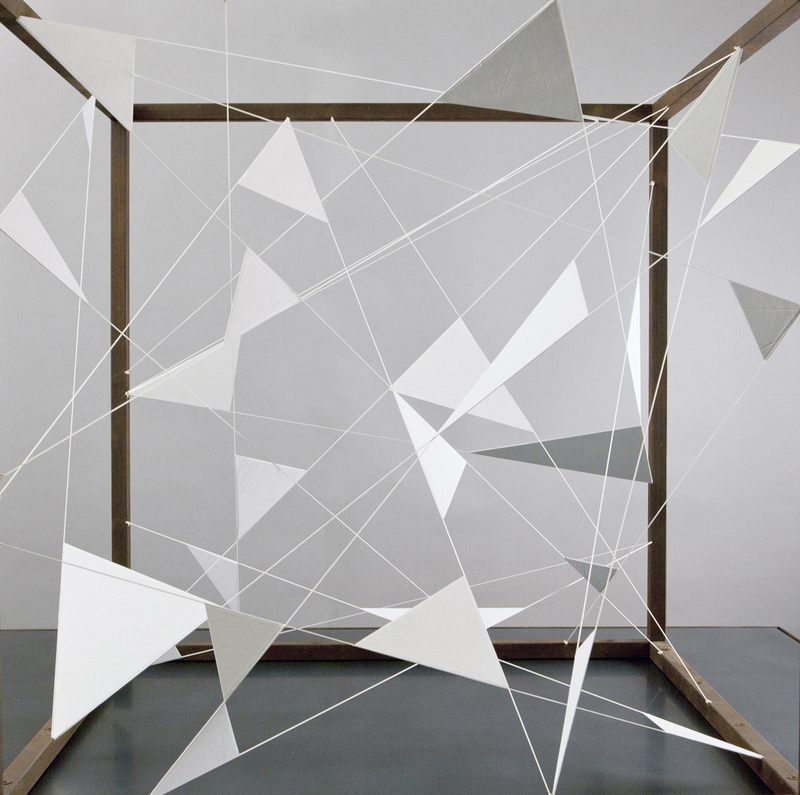 MO: In my work the cube appeared at a time when I needed to simplify my forms, to bring them to a primordial state. The idea of the cube comes from the need of formal research, investigating the formal dimension as well as the surface of the sculpture and form itself. I add then my own observations and reflections about what surrounds me: the human being, its physical and mental state, its behavior, the dynamics of contemporary society. SC: We spoke about personal and collective identity, about different nationalities and the environment where one grows, about the question of what personal identity is exactly. Those are central themes in your practice as an artist, and your work is therefore partly autobiographical. Tell me more about your country of birth and what you carry with you, in terms of both culture and art. MO: Armenia is the country where I was born and where I grew up. For me it is a magical place, with a strong impact that is both visual and sensorial, where I sense a feeling of timelessness. What I carry with me from this place is especially the rhythm. A rhythm of music that I can recognize everywhere: in nature, in the landscape, in prehistoric monuments as Portasar (today part of Turkey), in the archaeological site of Karahunj. I can see it in medieval churches, in architecture, in music, in cultural celebrations. SC: Nowadays it’s hard to categorize art according to geography/nationality, and maybe it’s exactly the task of art to teach us that, at least for culture, geographical borders are no longer important. At the same time, you cannot deny that the environment in which we grow and where we live forms us. Do you think that your sculptures reflect your origins, and if so, in what way? MO: I agree, art does not have, and should not have, any boundaries. I think that art is one of the few ways in mankind’s hands to be truly free. There cannot be any borders. At the same time, however, we cannot deny belonging to a specific culture, with its variety and diversity, mixtures, and peculiarities due to precise locations and geographies. Not to say that this is called nationality. On the contrary, it means confrontation, curiosity, growth, and exchange. And it means reaching new visions and experiences. Societies, whatever they are, are made from contamination and exchanges; none have ever been isolated from the outside world. Today this is sold to us as “globalization.” In reality this has always existed, just look at the big cities of Alexandria, Amsterdam, Barcelona, Venice, and so on. Talking about my sculptures, as mentioned before, I can say that I carry within me the rhythm of my origins, and I develop and I express it through my art, trying to find a contemporary visual language that is comprehensible to everyone. SC: You express your research and concepts through abstract and minimal sculptures. This is evident above all in your recent works, where you intervened on all four sides of a marble cube. The incised lines are directed to a hole at the center and constitute a kind of map, like roads that lead to a particular place, here still undefined. The central holes of each facade join in the heart of the marble block. The “windows” lead the viewer’s gaze both into and beyond the sculpture, and so the sculpture represents a multitude of different visions and levels of identity. A metaphor of our multicultural society without borders? MO: I think so. No boundaries, but still with culture.